The first thing to know is that his name is Daniel. Daniel Dixon. The shirt remains neatly tucked, the expression remains calm. If he sounds like a Wall Street banker, well, one day he may be one, like his older brother, a managing director at Goldman Sachs featured in Forbes magazine as a rising star in the world of finance. 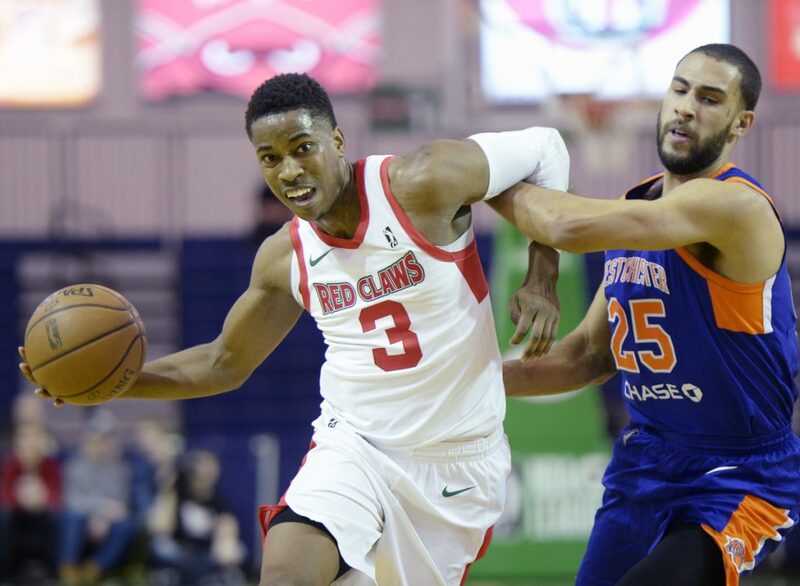 For now, however, the youngest of the four Dixon boys is earning a paycheck playing G League basketball for the Maine Red Claws. On Thursday night at the Portland Expo, Daniel Dixon made his sixth start of the season, scoring 22 points, grabbing seven rebounds, drawing two charges, making two steals and handing out three assists in a 113-107 loss to the Eastern Conference-leading Westchester Knicks. Dixon was on the floor more than anyone else – 45 minutes and 23 seconds – in part because the Claws were short-handed but also because of the 6-foot-6 Dixon’s versatility. At times he guarded Westchester’s quicksilver point guard Xavier Rathan-Mayes. At others, Dixon guarded 7-foot-1 center Luke Kornet or 6-5 NBA rookie Damyean Dotson, assigned to Westchester by the parent New York Knicks. The Claws took an early lead before fading against a talented team with a deeper bench. Because of injuries, illnesses and two-way NBA player Kadeem Allen suiting up for the Celtics in Boston, the Claws had eight players available, one of whom, recently re-signed guard Jerome Seagears, arrived at the Expo from Las Vegas 90 minutes before the opening tip. 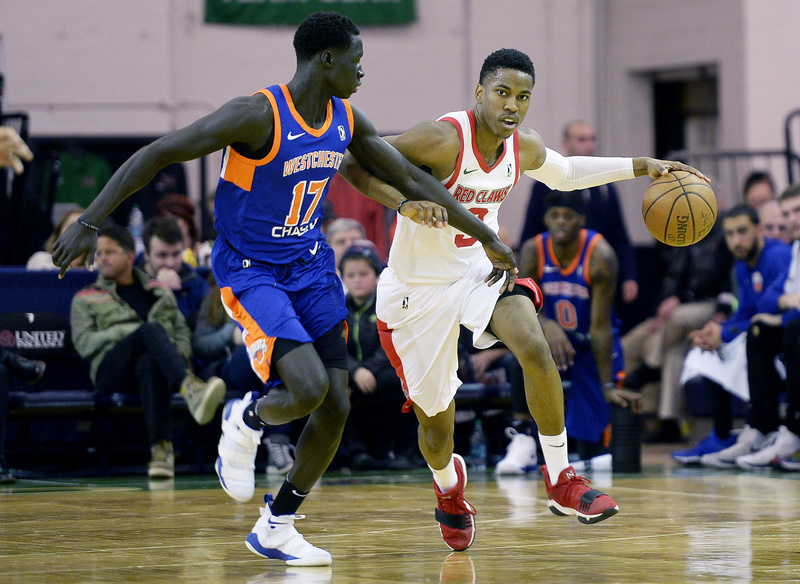 Daniel Dixon of the Maine Red Claws drives to the basket as Buay Tuach of the Westchester Knicks defends. “It’s another opportunity to make an imprint,” Dixon said of the challenge. As a senior in high school in Great Falls, Virginia, Dixon didn’t make much of an imprint, not with only 150 pounds on his 6-foot-3 frame. Only one college expressed interest so Dixon enrolled at Fishburne Military Academy and hit the weight room. Along the way, Dixon acquired a nickname that he now uses as his Twitter handle: Mr. Heat Check. “I hit a lot of clutch shots,” he said matter-of-factly. Dixon played four years at William & Mary, earned a degree in finance and signed as a free agent in August with the Celtics for their preseason camp. He played in two exhibition games before joining the Red Claws as an affiliate player. The Claws opened the season with four affiliate players and two (Allen and Jabari Bird) on two-way contracts. Of those original six, only Dixon and L.J. Peak played Thursday night. Bird is out with a back issue. Daniel Ochefu was traded and the Atlanta Hawks recently signed Andrew White to a two-way contract. Thursday’s scoring output was the highest of the season for Dixon, who had two 20-point outbursts in his first five games with the Claws, but has since seesawed after dealing with a groin injury and a concussion that caused him to miss four games. The goal, of course, is the NBA, but playing overseas is another option.